Spring is a good time to refresh your home. 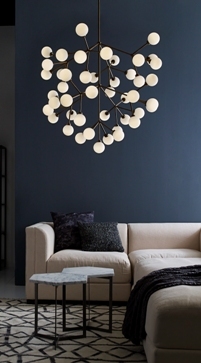 All it takes is one stunning light fixture to take your room from uninspired to spectacular. 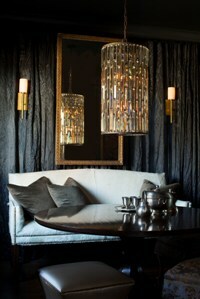 STYLE STATEMENT: A fixture can totally change your room's dynamic. 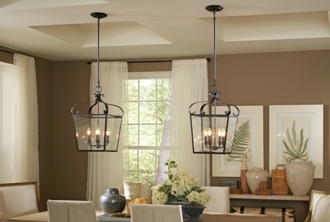 Splurge on focal-point fixtures. They set the tone for your home. With so much riding on one fixture, or set of fixtures, it's best to consult with a professional at an ALA-member showroom to get the look you desire. BULB BRIEF: Know your lumens and kelvins to get the right light. Much has been written and said about light bulbs these days. If you’re still confused about what light bulb to buy, you are not alone. Brightness: If you want something similar to your old 60-watt incandescent bulb, just remember 800 – that’s the amount of lumens that your new bulb should provide for a comparable level of light. Color: Trying to pick the right bulb with respect to color temperature is very tricky. A simple solution is to stick with the familiar, and use it everywhere. To do that, buy light bulbs that have the same Kelvin rating. Typical incandescents are around 2700 to 3000K. Choose bulbs in that color range for all the fixtures in a single room. 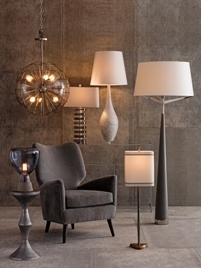 If you have two table lamps that do not match in chromaticity, it will be obvious to the eye. What is meant by layered lighting? The most aesthetically pleasing and effective way to light a room is to have three layers: overall, task and accent. Overall lighting is the main illumination in a room. This will be the light above the main work or living space. The overall light could be from a chandelier, multiple pendants, recessed lights, a ceiling fan with a light, or some other main light source. Task lighting is the light needed for specific tasks such as cooking, reading, applying make-up, etc. Examples of task lighting could be portable lamps, sconces next to a dressing area, and recessed lights or pendants directly over a work area. Accent lighting could be toe-kick or in-cabinet lights, cove lighting, or small portable lamps. Depending on where and how some fixtures are used, they could be any type of lighting. For example, pendants might be considered overall lighting or task lighting, even accent if small and in a corner. The important thing is to layer the lighting so that appropriate illumination can be achieved for the activity taking place. Visit an ALA-member showroom to talk to a well-trained lighting expert.